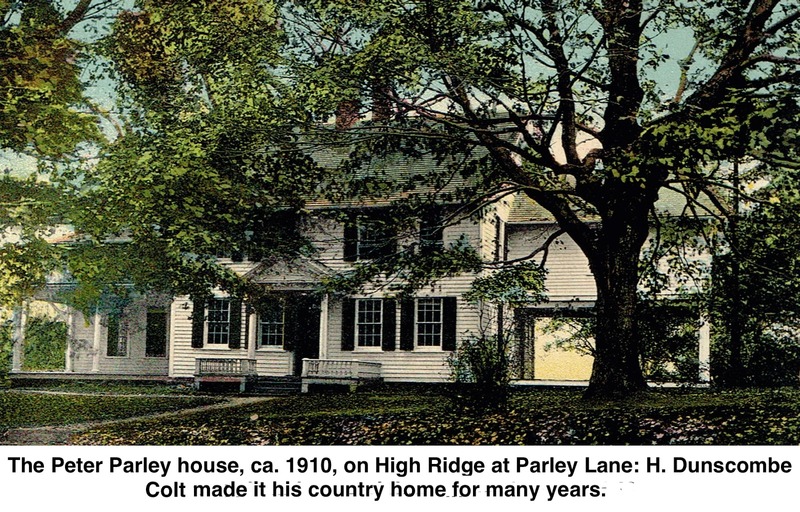 The historic Peter Parley house on High Ridge was home to not only its namesake author and his minister father, but another man who shared with them an interest in history, literature and religion. H. Dunscombe Colt was an internationally known archaeologist and an expert on Rudyard Kipling. Together with his father he lived in the 1920s, 30s and 40s where S.G. Goodrich (Peter Parley), son of the third minister of the First Congregational Church, grew up. His dad, a Yale-educated lawyer, and his mother, great-granddaughter of a New York City mayor, came here in the late 1910s and for a while, owned the Bluebird Apartments, located across the street from the West Lane Inn (though they never lived there). 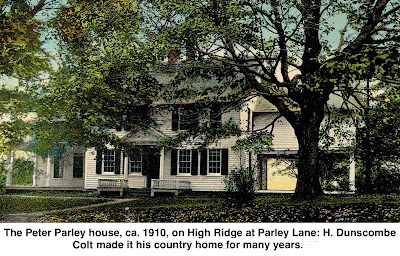 The Peter Parley property was much bigger when they bought it and around 1920, the Colts sold a triangular piece at High Ridge and Shadow Lane to the Hyde sisters from New Jersey, who then built the English-style cottages and cobblestone courtyard, surrounded by high stone walls, that are a landmark at the south end of High Ridge today. The Colts sent their son to England for his schooling. He studied at St. Paul’s and Oxford University, which he did not complete but at which he became interested in archaeology, the focus of his future career. His first dig was in 1922, excavating an ancient Roman site in Kent, England, with a team from London’s Society of Antiquaries. He then worked in Egypt under the noted British Egyptologist, W. M. Flinders Petrie, and took part in excavations on Malta. To that end he established the Colt Archaeological Institute, which financed archaeological digs but especially focused on publication of archaeological findings. “To be published by Colt was a sought after honour among archaeologists,” Bennett wrote in a 1974 tribute to her friend. Colt also inherited a love of collecting from his father, who had assembled an extensive series of engraved, historical views of New York City. For years he worked on updating an encyclopedia of American engravers. The work was done in cooperation with the American Antiquarian Society, of which he was a longtime member. For much of his life, Colt would spend the warmer half of the year in London and the colder six months in the United States. Here he would usually focus on researching engravers while in London, it would be archaeology and Kipling. Besides Ridgefield, he had homes in New York and Washington. 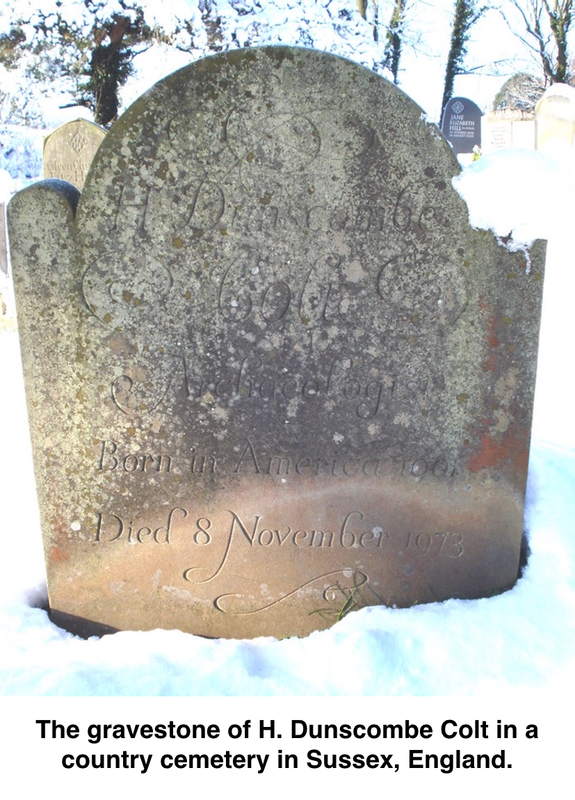 “Colt may have been shy and diffident, almost retiring, but he was completely cosmopolitan, equally at home on both sides of the Atlantic, with a truly global approach to life and a breadth of vision which brooked no limitations, particularly in archaeology,” Crystal-Marie Bennett wrote. Bologna Walsh, a native of Trieste, who later donated thousands of items in her husband’s archaeological, engraving and Kipling collections to museums and libraries in the U.S. and Europe. Many ancient pieces were given to the Metropolitan Museum of Art in New York. In 1984 and 1987, she donated 2,500 Kipling items to the Library of Congress which established the H. Dunscombe Colt Kipling Collection. It includes Kipling first editions, periodicals, books about Kipling, books Kipling owned, photographs of Kipling and his family, and drawings, manuscripts, letters, and clippings. Colt died in 1973 in London at the age of 72 and is buried in an old country churchyard in Sussex, overlooking the South Downs in England.